The Turf Club is back – and better than ever! You are here: Home / Entertainment / The Turf Club is back – and better than ever! 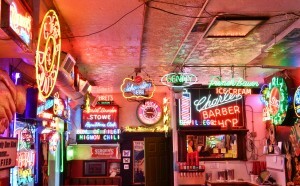 The Turf Club is a classic American burger joint with the coolest vibe and surroundings…..neon signs, cartoon characters from the 70’s and 80’s, music playing, beer and drinks flowing, a whole lot of laid back fun! Formerly known as Terry’s Turf Club, the name was changed under new ownership by Tom Kunkemoeller and his brother Mark as of January, 2019. They’ve kept all that was awesome, and have even added a few things, including new happy hour specials! In the restaurant industry his whole life, Tom Kunkemoeller left his position as the general manager of the Montgomery Inn Boathouse of more than 20 years in order to save this little gem. Kunkemoeller is excited for the new opportunity, and talks about some of the upcoming changes to The Turf Club: “Some of the outside neon had to go, but there are plans to add some exciting new stuff.” The Turf Club is where you’ll find Tom, always there making sure all is running smoothly, greeting customers, new and old. 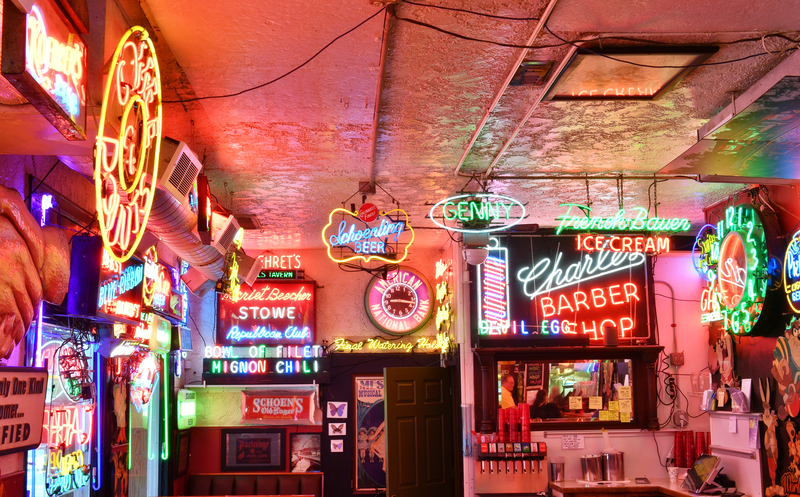 Located in Linwood right off Columbia Parkway, The Turf Club is known for its neon signs, uplifting atmosphere, and – most of all – the incredible stacked burgers! Boasting a wide selection of speciality toppings and sauces, the burger possibilities are endless. Not to stop there, The Turf Club also serves a variety of seafood, grilled chicken sandwiches and veggie options, along with lots of appetizers and a fully stocked bar to wash it all down. Don’t forget to check out Chicken on the Run – located in Deer Park – also owned by the Kunkemoeller brothers! You’ll find Mark there….at this down home spot with a great menu, awesome food, and a festive bar. Think chicken, sandwiches, amazing salads and appetizers…so many options! Two of your new favorites in Cincinnati….run by two awesome guys who happen to be brothers. Enjoy! ← Don’t Miss SPCA Cincinnati’s 17th Annual Fur Ball!